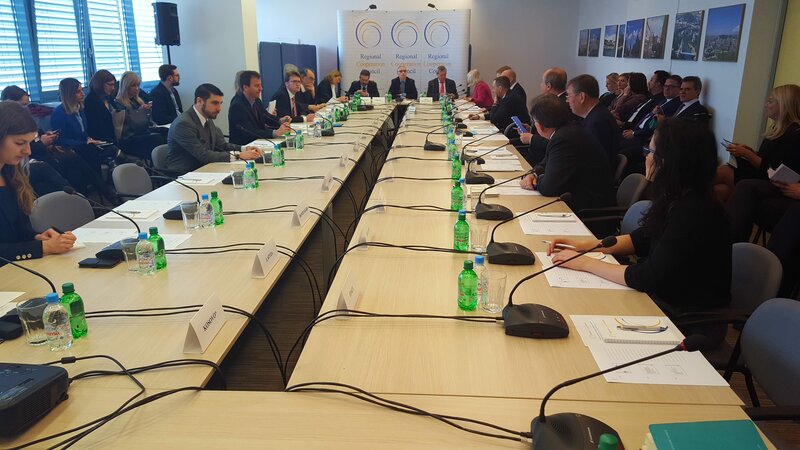 Sarajevo – The Regional Cooperation Council (RCC) Board met for the first time in 2017 in Sarajevo today. The RCC Secretary General, Goran Svilanovic presented the report on activities of the organization’s Secretariat in the period September-December 2016 and informed the Board on its key forthcoming activities. "The goals at the centre of the RCC Strategy and Work Programme for the upcoming period 2017-2019 resonate very well with what is envisaged through the regional economic integration agenda: free flow of goods, services, investment and people throughout the region”, said Svilanovic elaborating on specific activities that the RCC is to undertake supporting this agenda through its three flagships (Connectivity, Competitiveness and Skills and Mobility), as well as in the fields of Governance and Rule of Law, and Security Cooperation. Svilanovic used the opportunity to announce the RCC-organized Third Meeting on Donor Coordination, which is scheduled for tomorrow, 16 March in Sarajevo. The meeting will address needs and priorities of the region, providing an overview of the ongoing trends, requirements and achievements in areas of sustainable economic development, public administration reform, rule of law and freedom of expression, as well as current security challenges. Croatian South-East European Cooperation Process Chairmanship-in-Office updated the Board participants on the latest SEECP activities. The Board also heard presentation of the RCC’s project “Roma Integration 2020” getting familiar with their activities and plans. The representatives of Migration, Asylum and Refugees Regional Initiative (MARRI) and Regional School of Public Administration (ReSPA) presented activities of their respective organisations at the meeting.